Steaks are always kinda the same, right? No, not right. Even the most timeless of meats must be innovated upon. And then, of course, there are the classic cuts at places they've never been before. 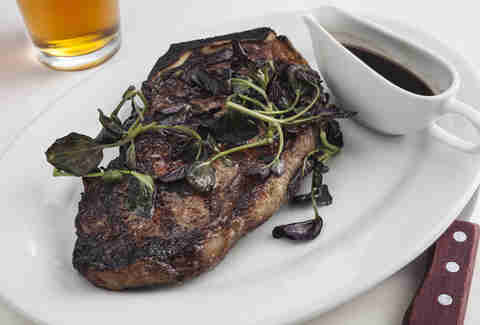 So we rounded up 13 delicious new NYC steaks you should start checking off your must-eat list. Also: start keeping a "must-eat list". 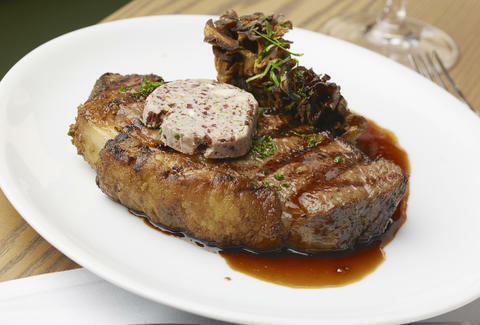 Recette kitchen-minder Jesse Schenker's new spot is doing casual, next-level American eats, including this beautiful cut topped with garlic compound butter and hen-of-the-woods mushrooms. This massive, airy bistro in the former Hurricane Club spot has you covered with a top-notch traditional steak frites. 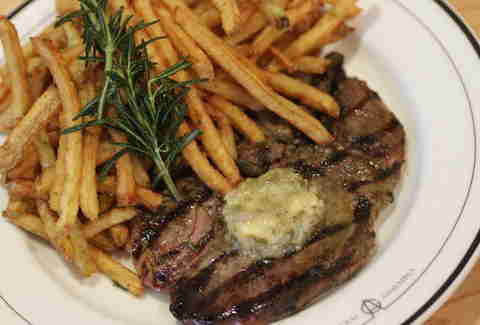 Wildcard: you can also go for the lamb steak frites -- an untraditional-but-still-delicious (and covered in butter) option. 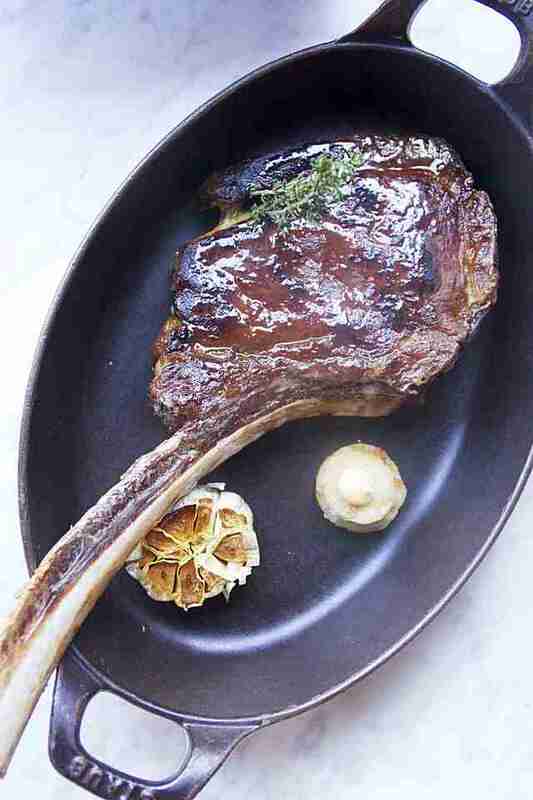 You may not think of this Italian trattoria from Michael White (who also owns nearby steakhouse Costata) as a steakstination, but thanks to their new, only-available-on-Wednesdays, supremely funky and tender, 120-day-aged Creekstone Tomahawk, it totally is. The latest entry in Ssam Bar's large-format game, this massive Niman Ranch meat slab feeds three-six people and is dry-aged 28 days, before waking up only to realize the world has been overrun by ZOMBIES!!!! It also comes with a bunch of sauces and sides, including dry-aged fat with brown butter roasting juices, red wine and shallot marmalade, bacon ketchup, fries, and a Caesar salad. They've got a dedicated steak frites section of the menu at this newcomer from the team behind Buttermilk Channel. Get down with the Bavette -- it's a thick-cut accompanied by their house-made steak sauce, and of course, fries. 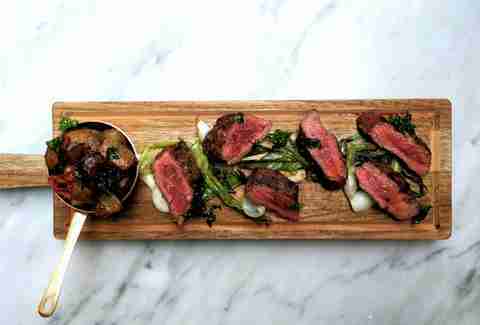 Although they're actually doing some crazy-awesome things with vegetables at The Standard East Village's anchor from John Fraser, the steak is destination-worthy on its own. 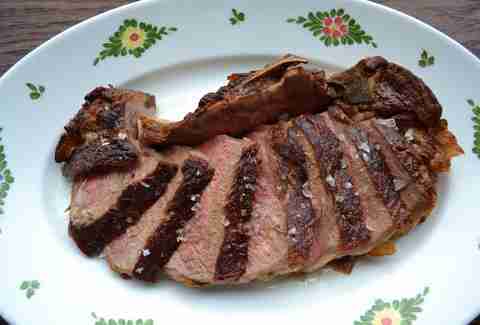 Pat LaFrieda meat is slow-roasted and served on the bone (or sliced into smaller pieces) with a gem salad and sea salt potatoes. After a hiatus, this recently reopened classic is back, cooking slabs over hickory logs. All of the cuts are pulled from a gorgeous meat locker where they age their beef in full view, including a killer New York sirloin that's got a great, Earthy-yet-juicy flavor. Their signature dish here is a traditional Colombian presentation of beef tenderloin, where they take the beef t-loin, wrap it in coarse and fine salt, and then cook it on a wet cloth over an open grill 'til "all that's left is a block of salt and a juicy steak". 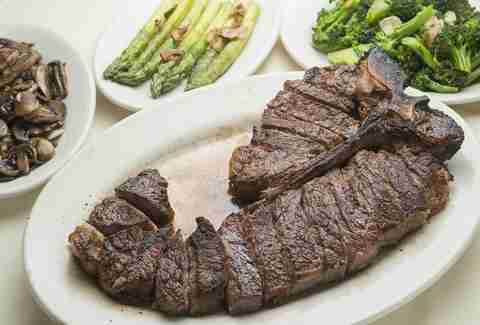 This newcomer ages its meat for just a little bit longer than the average spot (30-35 days), which makes its massive, signature porterhouse an incredibly flavorful standout. 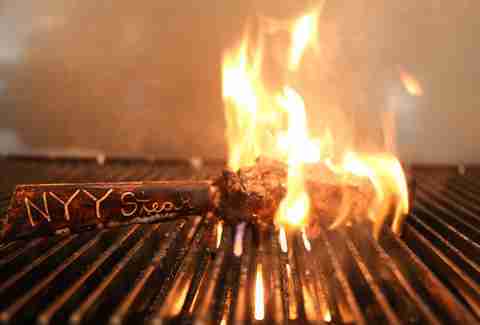 Amongst the autographs of 86 legendary Yankees in the three-story space, you'll find one of NYC's best 27oz, 21-day-dry-aged, bone-in, flame-grilled pieces of beef. Thank God pinstripes are slimming. Recently switching gears to become more steak-centric, La Cenita (from the guys behind Catch and The General) is going full-frontal-beef with a tomahawk rib eye that's dry-aged for 21 days, rubbed with guajillo chili, and then served up with roasted garlic & your choice of sauce. Grab a friend and/or a totally awesome date, and take on this 36oz beast for two. 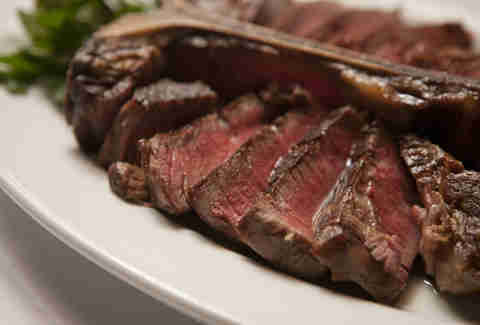 It's dry-aged for 28 days before ALSO waking up only to realize the world has been overrun by ZOMBIES!!!! HOW DOES THIS KEEP HAPPENING!!! Oh, and this guy is simply prepared: brushed with butter, seasoned with salt and pepper, broiled, and served in its own natural juices. This grass-fed beauty gets done-up nicely with grilled Spring onions, Yukon & purple potatoes, fresh garlic, and chili (to give you a little hit). Andrew Zimmer is Thrillist's NYC Editor and he's very familiar with the meat sweats. Follow him on Facebook, Twitter, and Instagram.